Ball, Georgiana. "Simon Peter Gunanoot". The Canadian Encyclopedia, 18 January 2017, Historica Canada. https://www.thecanadianencyclopedia.ca/en/article/simon-peter-gunanoot. Accessed 18 April 2019. Simon Peter Gunanoot, also Simon Peter Johnson, Gitksan businessman, outlaw (b at Kispiox, BC c 1874; d of pneumonia NE of Stewart, BC Oct 1933). Simon Peter Gunanoot, also Simon Peter Johnson, Gitksan businessman, outlaw (b at Kispiox, BC c 1874; d of pneumonia NE of Stewart, BC Oct 1933). 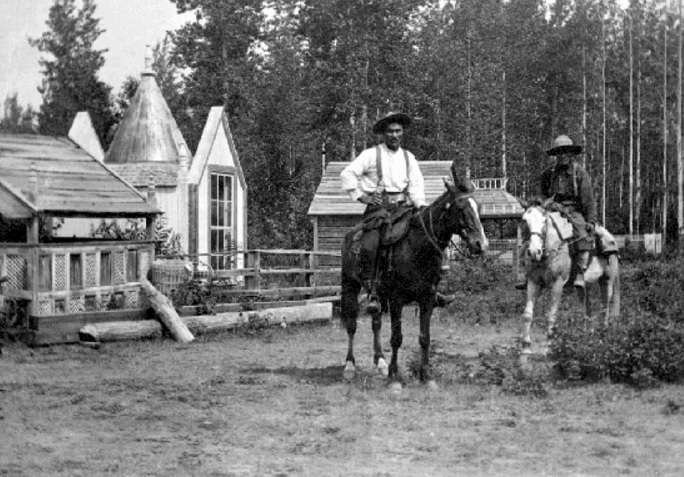 Gunanoot owned a store at Kispiox and ran a ranch and packtrain near Hazelton, and a trapline. On 19 June 1906, near Hazelton, Alexander MacIntosh and Max Leclair were killed by single shots in the back. Because Gunanoot had threatened to kill MacIntosh earlier, during a drunken brawl, the BC Provincial Police charged him with the murder of MacIntosh and, along with his brother-in-law Peter Himadam, with the murder of Leclair. Taking family members with them, the suspects escaped into the wilderness. For 13 years Gunanoot evaded capture, travelling on foot with his family and sometimes alone. He ranged from Bear Lake to Telegraph Creek to McDames, selling furs whenever he could. Although a $2000 reward was offered for information leading to his arrest, and many northerners who believed Gunanoot to be guilty actually saw him, none betrayed him. In June 1919, with the aid of rancher George Beirnes and noted defence lawyer Stuart Henderson, Gunanoot surrendered. In Oct an Assize Court jury in Vancouver found him not guilty of murdering MacIntosh, but the Crown stayed the Leclair murder charge. Himadam surrendered in 1920 and was discharged at the preliminary hearing. D.R. Williams, Simon Peter Gunanoot: Trapline Outlaw (1982).